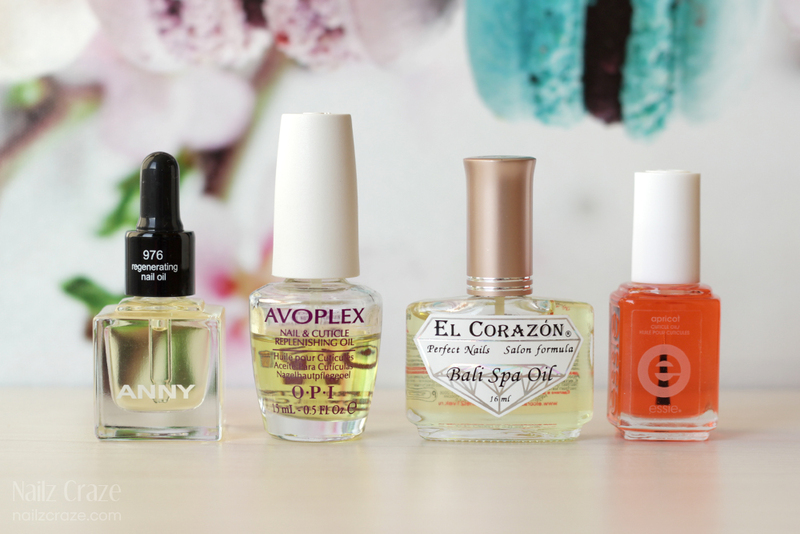 I get asked a lot which products I use to keep my nails in a good condition, and over the years I've tried many different products until I found the ones that are good and effective for me. So I thought it could be nice to share with you my current collection of the nail care essentials. I've been using Duri Rejuvacote for a couple of years now and this is definitely a product I'm sticking to and constantly repurchasing. It does a great job protecting the nails from staining, and I guess it's a god nail hardener as well, although I'm lucky enough to have naturally strong nails, but I hear it certainly does wonders for many other nail addicts. Cirque Holdfast™ Base Coat is another great base coat that I use a lot recently, and I love it. Ga-De's pretty much a clear coat and I don't feel it does much, I bought it a while back just to use with swatches etc that I remove right away. It's cheap and it's ok for that purpose. I got the Essence Gel Nails Primer when I mistaken it for a gel base coat, but it's actually a vaporating solution that you supposed to use before gel nail polish application. I think it's also nice to use before regular nail polish application, it helps to clear the nails from dirt and oils and preps it for a better adhesion of base coat. Haven't used it much, but when I do - I like it. OPI's Glitter Off is great with glitter nail polish removal (check my full review here), love this thing! Well, I think I should start with my all time favorite fast drying top coat - Poshe. It's really the best thing I've tried, it dries trough the nail polish coats quickly and leaves a gorgeous gloss. I've been using Seche Vite in the past but I hated the shrinkage at the cuticles and the tips, so Poshe is way better in my opinion and I didn't have issues with it. As for regular top coats, I really love Cirque Colors Liquid Laminate and Anny Super Gloss Gel at the moment. I've been also loving PUPA's Gel Top Coat and Glitter Gal Gloss Boss at the time. but they got a bit thick for me at the moment, so I kinda prefer using other top coats ATM. I also have this tiny bottle of Qtica (by Zoya) that I got with one of my Zoya orders, haven't used it much but I love carrying it in my bag in case I need to do my nails somewhere. My all time favorite matte top coat is without a doubt OPI's Matte Top Coat, it dries quickly and leaves the nails with a beautiful velvety matte finish that I simply adore. My current favorites are OPI's And ANNY's oils, as they are quite similar - both are light and have a nice delicate fragrance to them. El Corazon's oil is another great one, it's quite tick and also has a great minty scent, hens it's a bit more moisturizing. Unfortunately Essie's Apricot Oil was a bit of a miss for me and I'm rarely reaching for it. I've been using OPI's oil for ages and it seems like I'm never going to hit the bottom, so my advice to my-past-self would be to stick to one oil that you really like, although it's quite hard to resist trying new products. I would say that my must haves for cuticle treatment would be the Sally Hansen Cuticle Remover and Burt's Been Cuticle Butter. These two are oldies but goodies in my nail care routine and I would recommend it to every nail junkie. 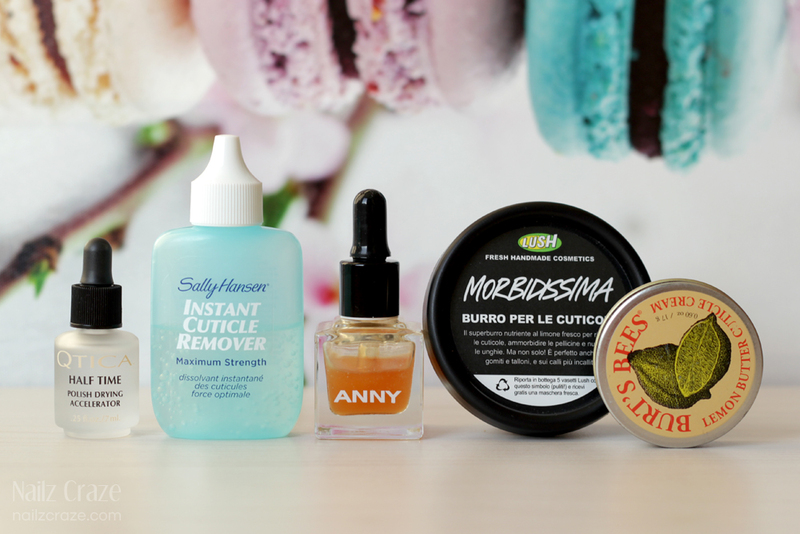 SH cuticle remover is the best one I've tried so far, and so is the BB cuticle butter. Recently I've been trying LUSH Lemony Flutter and I really like it to, although sometimes I feel it's a bit oily and sticky and don't have much patience to wait for it to absorb, but still it's good stuff. ANNY's cuticle removers is another nice product that I've recently tried, although I think it works better as a complimentary product to use between SH treatments, and not as efficient on it's own. A new product that I'm trying to incorporate in my manicures is the Qtica Half Time Drying Drops, which is another mini I got with my previous Zoya orders. I always forget about it because it's so tiny and it gets lost among other stuff, but when I used it the other day I really loved that it dried my manicure quickly trough the coats and if seems to be a great product. I hope you enjoyed this post and found it interesting. There are a few new nail care products from OPI that I'm waiting on to arrive, I've mentioned them on my facebook page and I'm curious to see how they will perform, and of course I will come back to report on my experience with them. Let me know which are your must have nail care products and how you take care of your nails. Спасибо, что поделилась!Очень интересный пост! 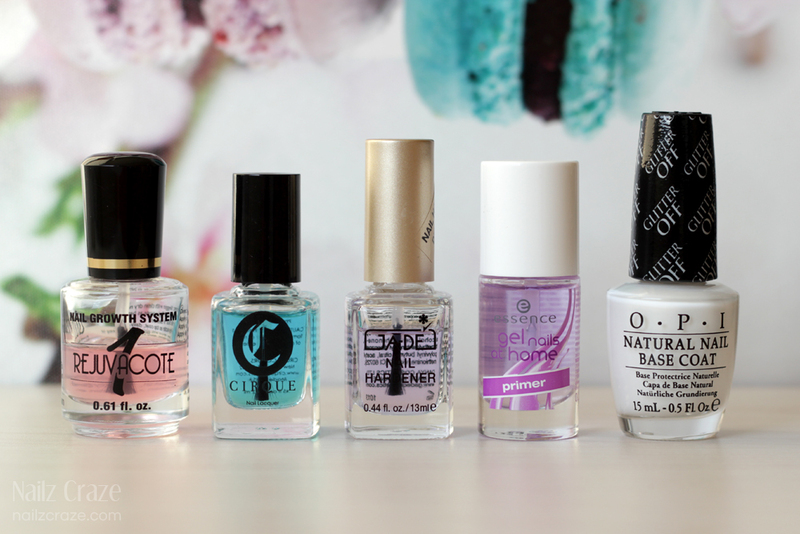 What great nail care essentials these are! I'll have to check some of them out now. I love reading this kind of post, it's so useful and inspiring for shopping of new nail care products! I think I'll buy soon Rejuvacote, it should be an amazing product. I'm now convinced once and for all that I need to try the Poshe!! מאיפה את מזמינה את הפושה? Thank you for sharing your nail care favorites. I'm always on the lookout for new products to try. Cuticle care is always my main focus.